Californian Darrell Schneider is known in the classic car community for his high-quality fiberglass skills. 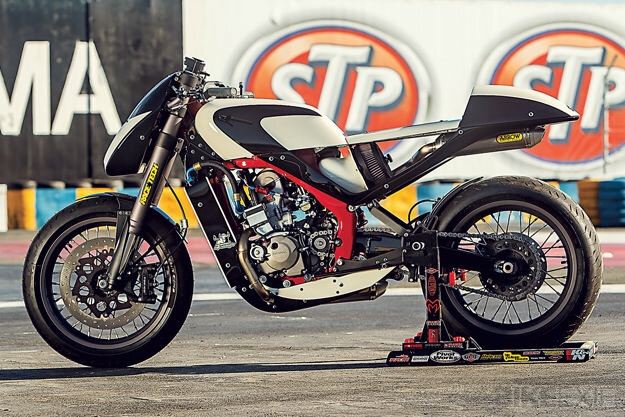 He’s also a keen motorcyclist, and has transformed his personal 2004 Honda CRF250R dirtbike into this eye-catching café racer. 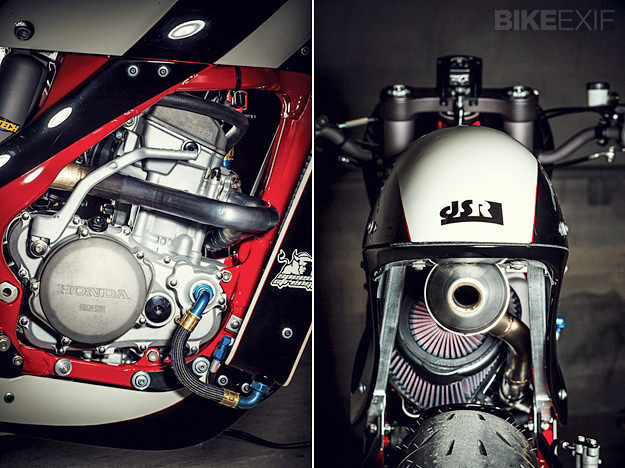 Modern café racers are often accused of being style over substance, but this CRF puts performance above all. 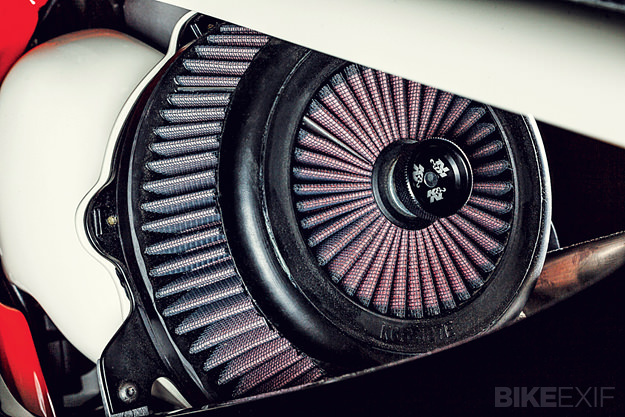 Schneider rebuilt the motor using later-model Honda parts, installed a Crower cam, and got the carburetor upgraded by Tokyo Mods. 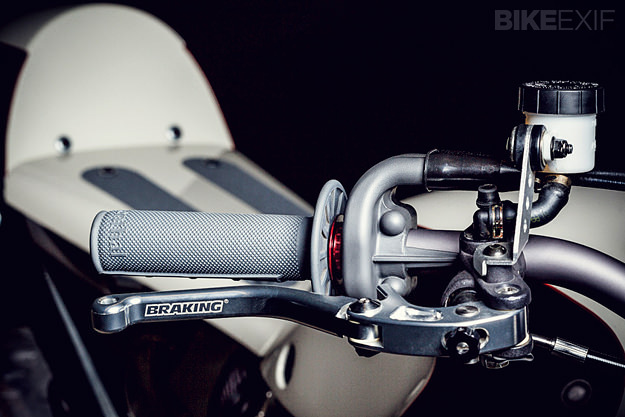 Race Tech has modified the CRF fork, and the rear shock now sports a Durelle Racing height adjuster. Custom triple clamps increase the spacing between the forks, allowing the use of wider rims, and also increase the trail geometry. The bike now rolls on Sun rims laced to Talon hubs; the front brake caliper is from a Honda CBR600RR. The bodywork is completely new, and all-fiberglass. And the neatest touch? For me, it’s the titanium Arrow exhaust system. At first glance it appears to be a single pipe, but if you look closer, you’ll see a second pipe snaking down towards the swing arm on the left side of the bike. 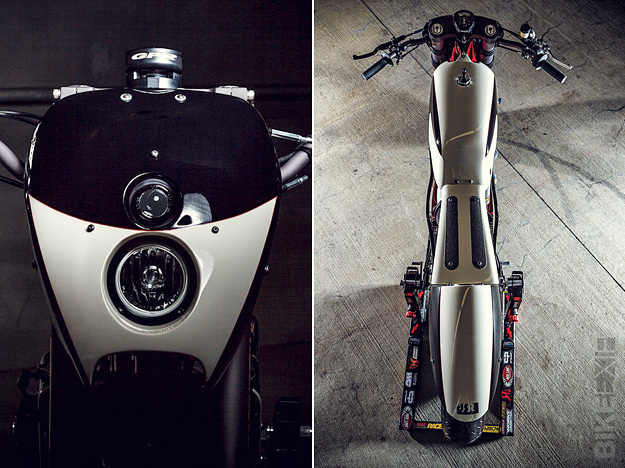 It’s the most original take on the café racer style we’ve seen for a long time.